From the shores of Cape Cod to the beaches of Charleston, Beachcrest Home celebrates the breezy and relaxed feeling of a waterfront getaway with furniture and décor that bring the beauty of the coast in, and the comfort of home out. Looking for a budget-friendly place to stash all your teen's favorite reads. Decorative yet functional, the Bush Furniture salinas 5 shelf bookcase feels comfortable anywhere from a cottage to a family home or apartment. The Bush Furniture Universal 5 Shelf Bookcase in Royal Oak features two fixed shelves for added stability and three adjustable shelves for storage flexibility. Bookcase In Rich Mahogany Finish With Four Shelves And Metal Handle Wooden Doors For Base Deposit Compartment. Strong Construction. Easy To Assemble. Size: 32 1/2 In. (L) x 25 In. (W) x 30 1/4 In. (H). Twin Falls Bookcase In Maple Finish. This Bookcase Is Available In Two Sizes, Four-Shelf And Six-Shelf. Provides Plenty Of Storage Space For Any Room In Your Home. Strong Construction. Easy To Assemble.Dimensions:4-Shelf: 31 In. x 13 In. x 49 In. (H)Weight: 83 Lbs6-Shelf: 31 In. x 33 In. x 77 In. (H)Weight: 92 LbsMatching Items Available. See Related Items Below. Bookcase In Cherry With Three Glass Doors And 3-Door Storage. The Perfect Choice To Organize Your Books. Easy To Assemble.Size: 49.5 In.(W). x 12 In.(D). x 72 In.(H). 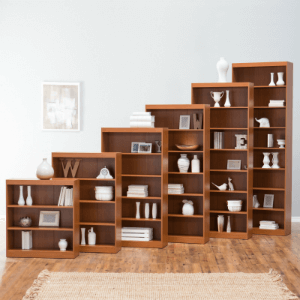 6-Shelf Bookcase With 3-Door Storage. The Best Way To Store And Organize Your Books. Beautiful Design. Easy To Assemble.Size: 49.5 In.(W). x 12 In.(D). x 72 In.(H). Louis Phillipe Bookcase In Deep Rich Cherry Finish. Crafted From Selected Veneers And Hardwood Solids. Bookcase Features Three Shelves And Lower cabinet With Doors. Strong Construction. Easy To Assemble.Size: 32 1/2 In. (L) x 14 1/2 In. (W) x 72 In. (H). Bookcase With Two Shelves And Two Door Storage. Easy To Assemble.Dimensions: 20 In. (W) X 11.5 In. (D) X 47 In.(H). Adjustable Bookcase With Glass Door in Mahogany Finish. Also available in Beech Finish, Coffee Bean, Mahogany and Light Cherry. The surface of the sides, top, bottom and shelves are American Red Oak veneer. Shelves are Adjustable. Easy To Assemble.Dimensions: (Wide) 32-1/2 In. x (Deep) 11-1/2 In. x (Height) 71 In. Adjustable Bookcase With Sliding Glass Door in Beech Finish. Also available in Light Cherry, Coffee Bean, Beech and Mahogany Finish. The surface of the sides, top, bottom and shelves are American Beech Finish veneer. Shelves are Adjustable. Easy To Assemble.Dimensions: (Wide) 32-1/2 In. x (Deep) 11-1/2 In. x (Height) 71 In. Bookcase. Includes Shelves And Two Bottom Doors For Storage. Easy To Assemble. Size: 32.6 In. (L) x 11.7 In. x 71 In. (H). Wooden Bookcase With Doors. Available in Natural Color. Easy to Assemble. Strong Construction. Book Shelf. Easy To Assemble.Dimensions: 13-3/4 In.(W). X 14-1/8 In.(D). X 61 In.(H). All Natural 3 Shelf Folding Bookcase. Easy To Assemble. Dimensions: 27-1/2 In.(L). X 12 In.(W). X 39 In.(H). Pewter Finish Book Shelf. Easy To Assemble. Dimensions: 32 In.(L). X 21 In.(W). X 60 In.(H). Book Shelf. Look Metal Frame And Wood Shelves In Natural Finish. Available: 3 Tier, 4 Tier And 5 Tier Book Shelf. Easy To Assemble. Details: 3 Tier Book Shelf: 25L. X 13-1/4W. X 34-1/2H. 4 Tier Book Shelf: 25L. X 13-3/4W. X 46-1/4H. 5 Tier Book Shelf: 25L. X 13-1/4W. X 58H. 4 Tier Shelf Bookcase In A Gun Metal Finish. Strong Construction. Easy To Assemble. Size: 25 1/2 In. (L) x 14 In. (W) x 54 In. (H).